Of all the places one would expect to see a flock of birds settled down for a group snack, the meat display at your local grocery store is probably pretty far down on the list. To that end, Walmart shoppers in Massachusetts were understandably surprised over the weekend, when at least two customers snapped video footage of a group of live fowl pecking away at packages of red meat. 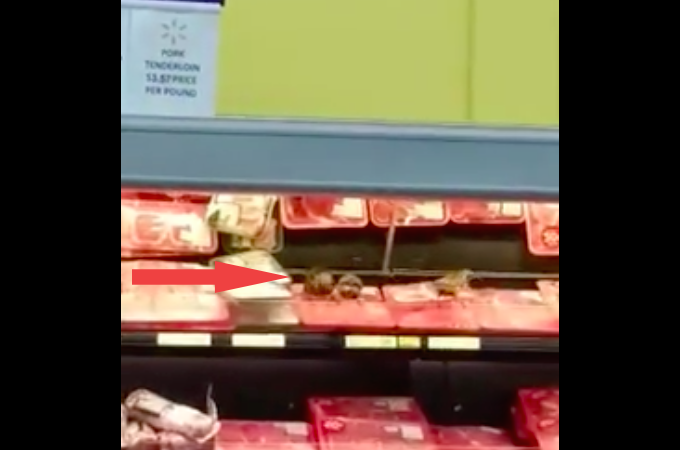 In the video, you can hear someone saying, “All that is bad… the whole top shelf,” as a Walmart worker begins removing products from the shelf and the startled birds fly off. He also said he told an employee, and claimed they weren’t concerned. “As sad as it sounds, they made it seem like it was a normal thing…’Yeah, they’re here’,” he told the news station. Western Mass News reported that the Chicopee Health Department investigated the building on Monday, with an inspector confirming that 17 birds were removed from the store. A Walmart spokesman told Consumerist that the store hired a professional to remove the birds, and that the company has additional safeguards in place to try to prevent a similar situation in the future, but did not elaborate on what those measures are. The spokesman did not have a comment regarding how often Walmart has had to deal with such bird incursions, or if this is an entirely unique incident.